INFORMATION-SURPRISE George Lippert :: The man with three legs and two hearts. George Lippert :: The man with three legs and two hearts. George Lippert was born in Germany in 1844. In addition to being born with three legs, he was also born with two functioning hearts although that condition was unknown until is autopsy in 1906. His third leg was fully formed and even possessed an extra toe, giving Lippert a total of sixteen. The leg was not functional. Lippert claimed that his leg had been fully functional until it sustained a fracture. Whether this is a fact or not remains a mystery, but during his career the leg hung motionless. 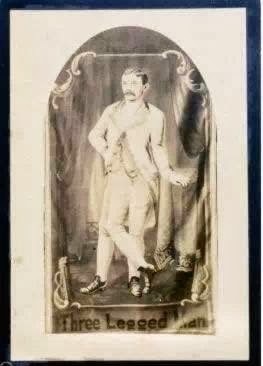 Early in his career George was billed as the ‘only Three Legged Man on Earth’ and he proved to be quite an attraction. Lippert even worked an exhibit with P. T. Barnum. However evidence indicates that he may not have been the easiest person to do business with. The pitch card above shows only a painting of Lippert and remains the only pitch card ever used by Lippert. Considering that his career spanned decades and coincided with a great boom in sideshow photography, this is highly unusual and raises several red flags.